Yother, Yothers, Yotter)|Yoder]], Miller, Coblentz and Kurtz. The 1954 membership was 67. A congregation was organized in April 1914, and Bishop Moses A. Coblentz served as the only preacher for one year. Succeeding bishops were John Bontrager, David S. Bontreger, and Amos Yoder (in 1954). A Conservative Amish Mennonite congregation was organized by members leaving the Old Order Amish in 1922, led by Bishop John Bontrager and Deacon John F. Helmuth. Their number was increased by families from Allen County, Indiana. After four years the congregation was dissolved, and the members moved to other states. In 1944 a Beachy Amish church was organized by members of the Old Order Amish congregation with the aid of Bishop David Burkholder of Nappanee, Indiana. It was dissolved two years later, many of its members having moved to other states. Hostetler, John A. "Defiance County (Ohio, USA)." Global Anabaptist Mennonite Encyclopedia Online. 1956. Web. 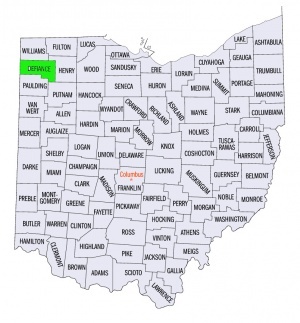 18 Apr 2019. http://gameo.org/index.php?title=Defiance_County_(Ohio,_USA)&oldid=120116. Hostetler, John A. (1956). Defiance County (Ohio, USA). Global Anabaptist Mennonite Encyclopedia Online. Retrieved 18 April 2019, from http://gameo.org/index.php?title=Defiance_County_(Ohio,_USA)&oldid=120116.